Our concentration in this class will include function, technique, comfort, aesthetics, and self-expression. We will also be working on creating line and gesture in the surface in myriad ways, including the use of thick slip. Finally, we will finish fire work in the soda kiln, which will include lecture and demonstration in this hands on workshop! There will be one soda firing, which means that you will have many cups that do not get soda fired. These pieces will be bisque fired for you to take home. Matt Long received his MFA in Ceramics from Ohio University in 1997, and his BFA in Ceramics from the Kansas City Art Institute in 1995. After receiving his MFA, Matt went on to become a Teaching Lab Specialist, Adjunct faculty, and Visiting Assistant Professor at The University of Florida in Gainesville for over six years. In 2005, Matt moved to Oxford, Mississippi, to join the art faculty at The University of Mississippi. Currently, he is an Associate Professor of Art, and the Graduate Coordinator for the Department of Art and Art History at The University of Mississippi. Matt has become a well-known workshop presenter, teaching workshops and lectures at over 40 universities, colleges, and art centers both nationally and internationally. His work earned him the NCECA emerging artist award in 2000 along with many juried awards and purchases into prestigious permanent collections. He has been featured in every serious ceramic art publication including Ceramics Monthly, Studio Potter, Art and Perception, and Clay Times, including being featured on the cover of the world’s most widely read ceramics magazine in 2004, Ceramics Monthly. Matt’s work can be seen in many national and international shows. He is represented by Red Lodge Clay Center in Red Lodge, Montana. 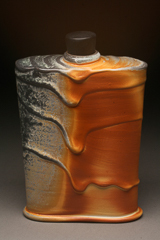 My passion for clay lies within functional pottery. I believe that pots have a nature of their own -- a soul, a breath of reality, that is inherently guided by their maker. In a world that is fast paced and oriented around convenience in life rather than quality of life, hand made functional pots can slow things down, allowing the user to enjoy the important aspects of human interaction and self-introspection. Hand made pottery is a complete human expression, not an interpretation of usable objects that only address a standard. These vessels fulfill ideas of function, explore the possibilities of gesture and craftsmanship, and ultimately tie my ideas and education to history and tradition. My pottery explores issues that go beyond simple utility and addresses relationships between maker, user, and object. These relationships are an integral part of my work. Making choices about the way a handle fits a finger, or a rim touches your mouth, are done intentionally to create a specific feel or mood to the piece. I predominantly use porcelain, because of its building qualities, whiteness, and ability to translate glaze surface and firing process. Recently I have concentrated on soda firing, and implements for whisky. Soda firing can create a sense of drama, a blush of color and variety of tactile surfaces, always leaving its marks on the work as it licks its way through the kiln. These jugs, flasks, and whisky cups are tied to history, making reference to German salt ware and early American pottery. For me, they are about friendship; they are about sitting and sipping, savoring the moment. They are about taking the material to its extreme, squeezing it with strength, and asking it to reveal something gentle. My interest and awareness toward surface and kiln atmosphere constantly challenges me in my choices of form and idea, always trying to simply enhance what already exists. I believe that the complexities of form and function are revealed through use. 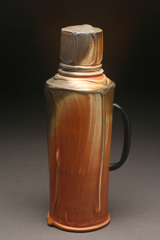 I strive to make pots that incorporate my intimate experiences, yet relate to the history and tradition of ceramics. Hand made pots are an integral part of my life; they inform life in a very direct way, becoming objects of satisfaction by their sheer beauty and sense of utility. In a world with goals centered on convenience in life rather than quality of life, I make these vessels to heighten our awareness of human interaction and self-introspection. These qualities take the hand made pot to a higher level by giving the user not only physical nourishment, but impacting the psychological and emotional aspect of everyday life, preserving that which has become most fragile -- time. - students should bring their standard pottery tools, with the addition of brushes that are from 2"-8" wide.